This impressively sized zombie decoration is enough to put the fear of the undead in anyone. 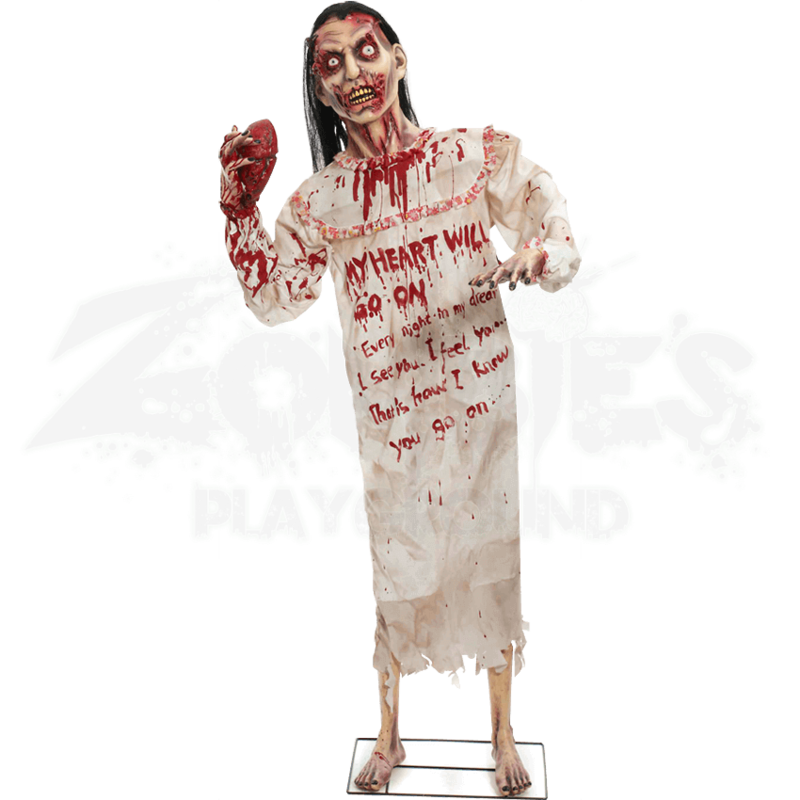 The Standing Heartless Zombie Woman is a full-sized figure that stands in tattered, bloody clothing while holding a heart in her hand. It is hard to tell if someone wronged this poor zombie girl, or if she is just your typical zombie who hungers for human flesh and blood. Either way, she is definitely one scary creature. Her face is riddled with marks of decay and damage, ranging from torn sections of skin around her mouth to out-right decayed flesh around her eyes and scalp. The skin on her neck is torn, while blood stains the front of her white dress. One hand reaches forward ominously, while the other is stained in blood and holds a human heart. Whether this zombie found it or ripped it from a humans chest is left to your imagination. Unlike the picture shown here, the actual zombie does not have words written across her dress. Instead, the cloth is only blood spattered. The zombie is primarily made of plastic and latex, with the majority of her frame being plastic while her hands and head are made from latex. The decorations hair is synthetic. A base with metal rods keeps the zombie standing upright. This zombie decoration is easy to assemble and breaks down for storage. When fully assembled, the Standing Heartless Zombie Woman measures an impressive 72 inches tall (6 Feet). The possibilities are endless with this truly impressive decoration. 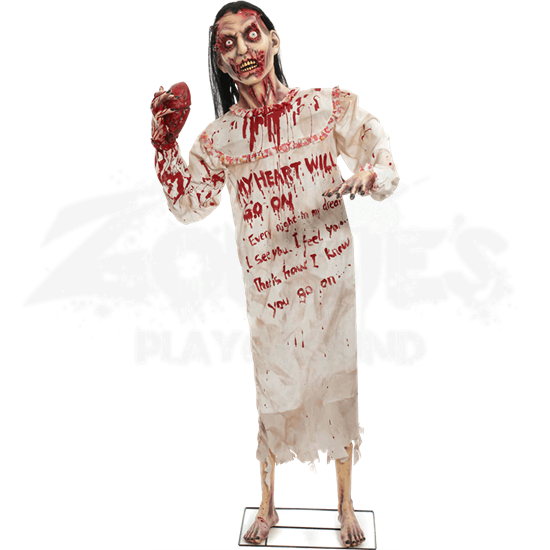 She makes a great stand-in for your personal zombie apocalypse, as well as a great decoration to put in your yard or in windows when Halloween comes. Or you could put the Standing Heartless Zombie Woman somewhere that will maximize her terrifying appearance in order to scare as many people as possible with her. It is your call.